Edie had been suffering from headaches that got progressively worse and more regular over 6 months. After seeing her GP she was referred to consultant paediatrician at Arrowe Park. Edie was given the preliminary diagnosis of migraines but referred for an MRI scan just to be sure.Results of the MRI scan came back that Edie had a ‘lump’ found in the brain stem. This is a part of the brain that cannot be operated on because of the location so far centre and the sensitive nature of the area.The referral was made to Alder Hey children’s hospital and after more scans they have told us they are 95% sure that this is a brain tumour called a Diffuse Intrinsic Pontine Glioma (DIPG). DIPG is a rare brain tumour that occurs in children. The location in the centre of the brain means they cannot operate and surgically remove it. Here in the UK chemotherapy is not an option because the levels needed to treat this tumour would poison the rest of the body. Radiotherapy would alleviate symptoms, make her more comfortable and ease any pain but we would inevitably still lose her. Our current goal is to raise approximately £700,000 to cover the cost of flights and treatment for our Edie, which include specialised chemotherapy and immunotherapy but currently this is just a ballpark figure, she may need more, or less than the standard amount of treatments. However we would love to exceed this figure to enable us to help other children and families in the future. 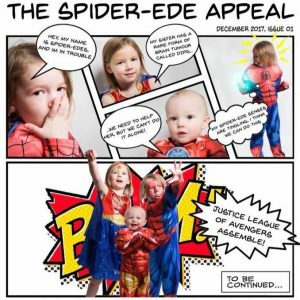 All cash donations are held by BLF in restricted funds for Edie’s campaign. BLF will hold funds on behalf of Edie and pay invoices directly.